A few weeks ago, I spent my Thursday shadowing our NESS SEA AmeriCorps Members. 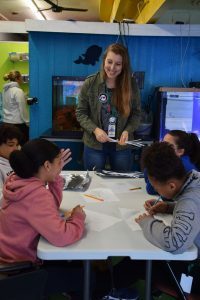 The NESS SEA (STEM Education Ambassador) AmeriCorps program uses national service to engage the students of New London in STEM-based ocean adventure learning. 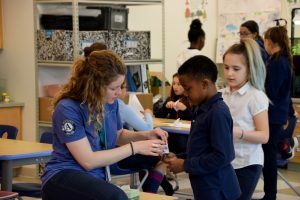 Our AmeriCorps program is such a fantastic element of NESS and critical piece of New London Initiative, so I figured I would give you an inside look into what a day in the life of an AmeriCorps member looks like. Just like the members, I was on the go all day, moving classroom to classroom and school to school! This school year, two members have been stationed here as their main host site and fellow NESS SEA members join them each morning and afternoon to help lead enrichment programs. Members lead 4 different hour-long enrichment programs each school day, working with students from grades Kindergarten through 5th grade. The curricula for these enrichment programs has been created by the NESS SEA AmeriCorps members and is centered around innovative STEM principles including water sciences, marine biology, engineering and design, weather, and human impacts on the environment. In the particular class that I visited on this day, AmeriCorps members Anna and Raina led their 5th grade students on a journey through the constellations. The class focused on the question “How does the Big Dipper relate to early sea navigation?” Students imagined themselves back in time aboard a vessel with only the stars and their charts to guide them. They mapped out their journey using star charts and drew out the constellations to interpret the pictures in the sky. I watched as the students and AmeriCorps members excitedly planned their voyages together in this hybrid sailing and astronomy lesson! 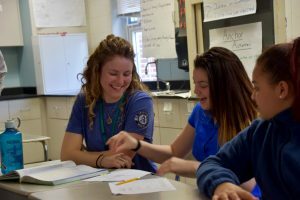 AmeriCorps members works with a variety students and grade levels during the day at this campus, which includes students in grade 6-8 at STEM Magnet Middle School (SMMS), Arts Magnet Middle School (AMMS), and the Language, Culture and Leadership pathway (LCL). During a typical day, the six AmeriCorps members stationed at this campus provide support for students during their class periods and provide an additional safe space in their school called Quiet Cafe. On this Friday, I followed Anna to one of the classes she helps in each day: Mr. Barber’s 8th grade biology class. The topic for the day was mendelian genetics and alleles. This topic can be tricky for any students, especially in a large class with 25+ students and only one teacher. This is where the AmeriCorps members step in and become a crucial part of the classroom. I watched while Anna checked in on various students in the class, helping some redirect their focus back to the lecture, asking others about their progress on their assignment. Students would ask for her by name to come over to their desk and help them work through a question from Mr. Barber’s lesson. At the end of the class period, the appreciation for Anna’s presence in their classroom was apparent from both the students and teacher. After biology class ended, I took a quick stop by NESS’s Quiet Café. Quiet Café is another way that AmeriCorps members provide support for students at BDJMSC By providing a quiet and safe place for students who need an alternative lunch spot from the cafeteria. Quiet Café allows students to work on their social skills and have a break from the chaos of their school day while they enjoy eating their lunch in a more suitable environment with their peers and the AmeriCorps members. When lunch and loitering were finished at Quiet Café, I headed over to the NESS classroom at Ocean Beach Park. This classroom is always buzzing with programs and projects, both during the height of beach season in summer and throughout the entire school year. This particular afternoon, AmeriCorps members Mark and Lauren were getting ready for their weekly program with a class from the Language, Culture, & Leadership pathway at BDJMSC – the LEAD Field Experience class. This particular class has been attending NESS once a week this school year at the Ocean Beach classroom. These students are currently working on a student-led social change project to bring awareness to the issue of marine debris and its detrimental effects. Through a collaborative art piece – two sculptures, one taking the form of a kayak, the other a fish – students are using marine debris to literally create a picture of what marine debris looks like in their community. Like the Bottle Brick Bench that students in this class created a couple years before them (which still stands at Ocean Beach! ), these students have identified a problem in their world that they are passionate about and have been given the freedom and capacity, through their class at NESS, to put their words into action and advocacy. As soon as the LEAD class cleaned up for the day, members Mark and Lauren immediately began preparing for an afterschool program with STEM Magnet Middle School students at Ocean Beach. As I ducked out before this last program of the day commenced, I reflected on all the moments I witnessed while walking in an AmeriCorps member’s shoes. Each day as a NESS SEA AmeriCorps member is marked by many moments fostering many great ideas with many students; some moments overwhelming, some moments frustrating, some moments funny, some moments exciting, but mostly many moments gratifying. On this day, I only visited a handful of programs compared to all the things AmeriCorps members are involved with each day throughout New London. I will be heading back soon to visit members serving at other sites in town that I didn’t have a chance to on this day, including classes at Harbor School, Nathan Hale Arts Magnet School, Arts Magnet School (AMMS), and the Drop-In Learning Center. Want to join?! We are currently recruiting members for the 2018-2019 school year! Learn more and apply today!